The event is held every two years and because of its severity and long stages without support, the event is only open to very strong duathletes with proven Elite MM experience and good mountain skills. The route crosses all the 4000 foot peaks in Scotland, is 32m/13400' on foot and 61 miles by road bike from Glen Nevis in Lochaber to Glenmore in the Cairngorms. The route starts in Glen Nevis and begins with the ascent of Ben Nevis, Carn Mor Dearg, Aonach Beag and Aonach Mor. 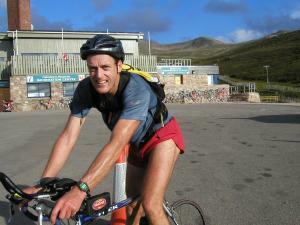 After dropping off the mountains, the competitors then continue for 60 miles by road bike to Glen Feshie. The final section is twenty-one miles across the Cairngorm plateau, taking in Cairn Toul, Angel's Peak, Braeriach, Ben Macdui and Cairngorm. The record is 11 hours 35 minutes 59 seconds by Jim Davies in June 2001. The race was held in 2003 on Saturday 19th July and there were 26 starters. Competitors were allowed to start on the hour between 4am and 7am and this allowed the steadier competitors a longer period to complete the race. The idea is that everyone should finish at Glenmore between 18:00 - 22:30 hrs. The weather on the Ben was grotty and even the top competitors were making navigation errors as they crossed the Aonachs. Descending Aonach Mor to Nevis Range competitors had the choice of running the descent or using a mountain bike they had positioned the previous night at the top of the specially created precipitous mountain bike descent route. Competition on the 60-mile biking section to the Cairngorms was intense, as the top competitors tried to regain placed lost through poor navigation on the Lochaber peaks. The weather improved steadily throughout the day and it was a magnificent afternoon/evening in the Cairngorms. However, at above 3000 feet the mist was down and after a long and featureless section into the mountains from Glen Feshie a number of competitors who maybe should have known better, arrived at their first Cairngorm summit to find the electronic timing box informing them that they were on Angel's Peak and not Cairn Toul, some 600M to the east. A dogleg was required to visit Cairn Toul and this cost them places. Jonathan Whitaker was out in front and making all the right route choices. He consistently increased his lead on the way to every Cairngorm summit and finally won the race in 12hrs 8mins, beating Paul Deegan of Kendal by about 40 minutes. This was a great performance as the conditions were a little slower than in 2001. The ladies race was a hard fought battle, although Sarah Wingrove set off at 5am and Liz Cowell at 6am so neither of them ever knew precisely how well the other was performing. Sarah won the ladies' race and was placed 6th overall in a time of 13hrs 29mins, which reduced the record by almost 50 minutes and was 70 minutes quicker than her 2001 time. She climbed from the Lharig Ghru to the summit of Ben Macdui in an amazing 39mins 56secs, more than 5 minutes quicker than the fastest man and as quickly as Jim Davies in 2001. 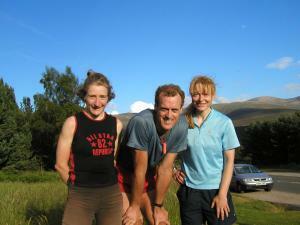 Liz Cowell was second lady, also in a very good time of 13hrs 48min and this improved her 2001 time by 30 minutes. Of the 22 out of 26 who completed the race, 4 of the competitors were ladies and the ladies improved their times very significantly while the men's times in general were slower than in 2001. Everyone was home by 10pm and we all enjoyed some refreshments, a chat and the prize giving in the bar at Glenmore Lodge.